Try these delicious recipes featuring canned pears year-round. For a larger version of the infographic, click on the image. Growing up in central New Jersey, I loved to eat the fresh fruit from the two pear trees my family grew in our backyard. I found it special that we had the chance to grow these healthy treats at home. Though I didn’t know it at the time, pears grow commercially in almost all 50 U.S. states, and are even the state fruit of Oregon. Even so, anyone who’s ever eaten a fresh, juicy pear knows they’re rather delicate and don’t always travel well. Canned pears are an easy solution to this. When canned, pears retain their tastiness and offer a portable, cost-effective and healthy solution in the off-season. Pears are also very versatile. In our latest infographic from MyPlate’s “5 Ways” series – which features recipes from USDA’s Supplemental Nutrition Assistance Program (SNAP) – you can check out creative and low-cost ways to incorporate them in meals. Options include pears canned in water or 100 percent fruit juice. Need to eat more fruits and veggies? (Who doesn’t?) Try this healthy and delicious salad to get you closer to your goal. A lot of good stuff is packed in this recipe! This sweet and savory take on the classic quesadilla is a creative way to add more fruit to your day. Try this recipe for a quick and easy lunch. This meal requires no cooking and is another sweet and savory combo that is sure to please. This is a great snack and adds a little twist to traditional salsa made with tomatoes and onions. With just three ingredients, this simple dessert is low-cost and super easy. And, yeah, these pops are delicious! The other “5 Ways” infographics – including Canned Peaches, Frozen Broccoli, Berries, Yogurt, and more – are available at www.choosemyplate.gov/5ways. For more information about foods that grow in your state, visit our MyPlate, MyState page. 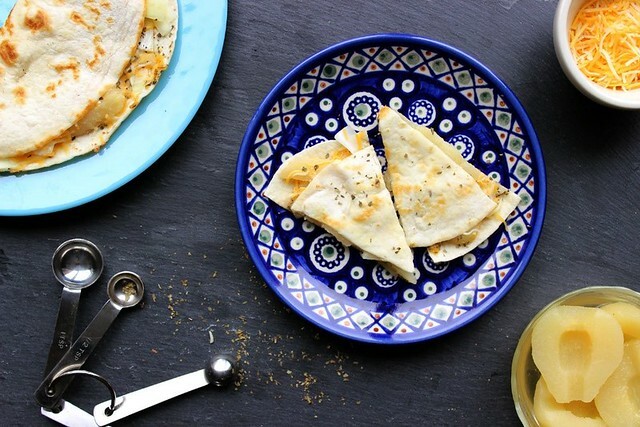 A delicious twist on a classic recipe — sweet and savory Pear Quesadilla. How to use pears not from a can? These sound delicious! The graphic is terrific and very appealing! I can't wait to make all of these. I will probably use fresh pears. Thank you! @Joseph Cohen - Thank you for reaching out! Fresh pears can be substituted for canned pears in the recipes. Their consistency will likely be a bit firmer than canned pears, so slices may need to be thinner and chunks may need to be smaller. Enjoy! Awesome recipes. I think you ought to include more fruits into recipes on here. Walden Farms makes a great sugar free, fat free and no calorie dressing that will pair well with pears and other fruits in salads.